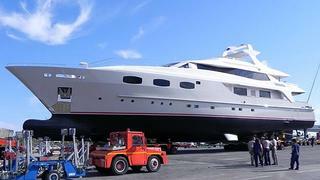 Baglietto’s much-anticipated 43m motor yacht Why Worry was launched on schedule in Viareggio on Tuesday, July 26th. Designed by Francesco Paszkowski, Why Worry had her final work completed by Baglietto workers at the Rossi Navi shipyard. ABS classed and fully MCA compliant, she can accommodate up to 12 guests in five cabins together with a bridge deck study that converts to sleep one. Why Worry is currently for sale with Mike Rich at Yachting Partners International. Asking €17.75 million, Why Worry will be available to view at the Monaco Yacht Show.